I taught my eldest son how to read using this book, and now I’m teaching my younger son with it. I also use Starfall.com and games to help reinforce the blend sounds or sight words, etc., but for the most part, I’ve relied on 100 Easy Lessons. I could be wrong, but I believe that a child will begin reading when he or she is ready to read. Some children are early readers and others begin reading later. I don’t think this has any bearing on intelligence. There is something about those connections in the brain that makes reading easy for a child to pick up on, or, if the connections haven’t happened yet, it’ll remain difficult — or impossible — until they do. Still, I have found it’s helpful to do short, light-hearted reading lessons, and I bet any reading curriculum (as long as you enjoy it) would do. Once my son was ready to read (at about 8.5 years old), it seemed to happen overnight. Everything I had taught him suddenly clicked. I recommend that parents read the front matter, and if you do, you may not like it because the instructions are rigid. For example, you’re supposed to follow the script exactly. I did that for a short time until I became comfortable with how the lessons worked. Then I was able to use my own words when doing the lessons. Now I don’t read the script or follow any of the instructions. In fact, I don’t have to say anything, if I don’t want to. My son knows the drill…. he reads all the sounds, words, and story (twice), and I help him, if he needs it. We don’t do the writing exercise because I have him work on handwriting separately. I also don’t follow the rule that you have to do one lesson every day for one hundred days. This is silly, in my opinion. We do lessons about three times a week, and I find this is a good pace for a child who isn’t an eager reader. Also, for both my sons, I stopped using 100 Easy Lessons for a whole year somewhere between lessons 65 and 70. At this point, it gets harder. So, I waited a year, and then I started again at Lesson 50 and continued until the end of the book. (For my youngest, we’re currently doing that now.) This has worked very well for me because a child matures and is capable of so much more, if you just wait a year. Some people worry about the Distar Method because it uses an altered orthography or symbols to help a child read the sounds in the book. It also introduces basic grammar slowly, such as that you capitalize the first letter of a sentence. None of this was a problem for my boys. They didn’t get dependent on these “helpers.” First of all, my boys see the written word in many different places. I read books to them! Secondly, by the end of 100 Easy Lessons, there has been so much repetition that they can easily recognize many of the high frequency words. Overall, I found those “helpers” to be, well, very helpful. You can’t assume that your child will be reading fluently by the time they have finished 100 Easy Lessons. Like I said, my eldest son was 8.5 years old before he began reading fluently. We finished 100 Easy Lessons when he was seven. I followed up with having him read several of the recommended books (listed in the back of 100 Easy Lessons), and we simply continued a reading practice a few times a week, a few minutes at a time. Once everything “clicked,” I never had to do another reading lesson with him. 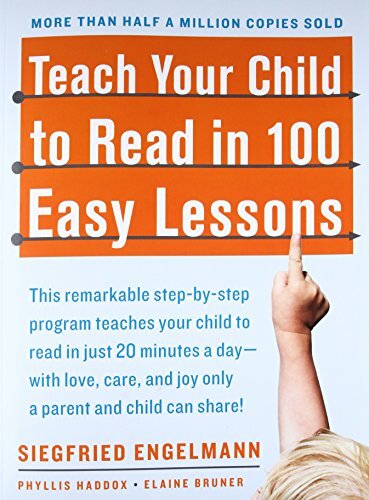 Teach Your Child to Read in 100 Easy Lessons worked for us. I think it could work well for many children, but like with any curriculum, you might have to tweak it for your kids’ unique needs. Don’t be afraid to do that. Ever.